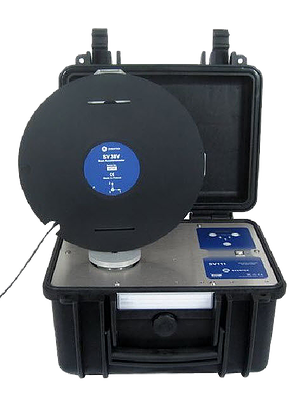 SV 111 Vibration Calibrator is the State of the Art instrument designed for in-situ checks according to ISO 8041. In-situ checks are intended for application in the field prior to and following a measurement or series of measurements. They act as a check of the instrument’s basic calibration and functionality. 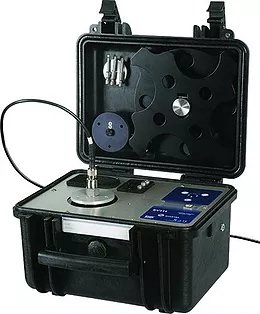 The SV 111 is suitable for calibration checks of various types of vibration meters at different frequencies from 16 Hz up to 640 Hz. Depending on the selected frequency user may select level of calibration from 1 m/s2 to 10 m/s2. The design of the calibrator is based on the built-in triaxial reference accelerometer and microprocessor-controlled shaker. Following ISO 8041 requirement the reference accelerometer measures the cross-axis / transverse vibrations to detect interference on the calibration signal. Faults caused by transverse vibrations are indicated by three LEDS on the calibrator’s panel. This unique solution ensures the excellent stability of the calibration level & frequency independently from mass of the testing object. Shaker can be loaded with large weight up to 1 kilogram. Any improper object fixing is automatically detected and indicated by LEDs on the calibrator’s panel giving the information about direction which should be corrected. For calibration checks of tri-axial sensors set of dedicated adapters is available including a special adapter to Svantek whole-body sensors (seat-pads) for direct mounting on the shaker. Other types of vibration transducers can be conveniently attached using mounting stud, mounting disc or dedicated adapter. Low frequency calibration at 15.92 Hz with maximum payload of 1kg!